Relation of Attorney and Client. A legal representative, empowered to plead on behalf of the person represented. Attorneys at law are unknown in Jewish law. The examination and cross-examination of the witnesses were conducted by the judges; and in criminal cases the law imposed upon the judges the duty of carefully guarding the prisoner's rights. Attorneys in fact were permitted to appear for their principals and conduct litigation, subject to certain restrictions. The Talmudic law on the subject is found in the treatise Baba Ḳamma (70a). According to this passage, an Attorney was authorized to represent his principal only for the purpose of receiving property from a bailee or trustee, when there was no dispute concerning its ownership. If there was a contest as to the title to the property, the Talmudic law did not authorize an Attorney to appear. At the law academy in Nehardea it was taught that an Attorney could appear only for the purpose of taking possession of real estate, but not to recover movable property. The Geonim, however, modified this Talmudic principle, and permitted attorneys to appear in contested cases also. Rabbi Hananeel of Kairwan, who lived during the eleventh century, reports that in his time it was lawful to appoint attorneys in all cases, whether the controversy was concerning movable or immovable property, and whether there was a contest or not (Tosafot, B. Ḳ. 70a, ); and this opinion was generally accepted in the later law (Shulḥan 'Aruk, Ḥoshen Mishpaṭ, 123, 1). 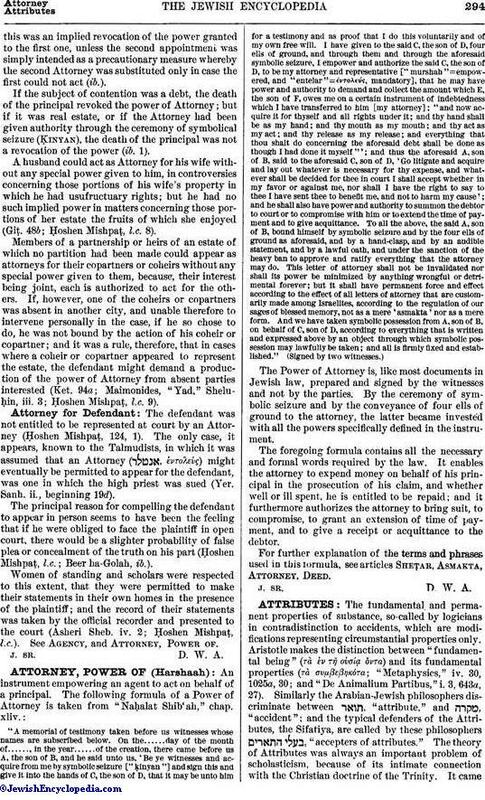 The power of Attorney had to be in writing, and to contain the words "proceed, litigate, acquire, and possess for thyself and compel the adversary to give up what is due," or words to that effect; and if such words were not used, the defendant was not obliged to answer the Attorney, and could plead in bar of the Attorney's right (B. Ḳ. l.c. ; Maimonides, "Yad," Sheluḥin, iii. 1; Ḥoshen Mishpaṭ, 122, 4). It was at first thought that the relation of Attorney and client was like that of partners, and that the Attorney could retain one-half of what he collected; but the final decision was that their relation is like that of principal and Agent, and that the Attorney was obliged to account to his principal for all that he had done or received (B. Ḳ. l.c.). The principal was obliged to pay all the expenses of the Attorney and to indemnify him for all outlays; and all powers of Attorney were customarily drawn with a provision to that effect (Ḥoshen Mishpaṭ, 122, 6). Any person could act as Attorney for another. Even women and slaves could be empowered. The principal's own slaves, however, were not permitted to represent him (ib. 123, 13); and, subject to certain regulations, even non-Jews were authorized to act as attorneys for Jewish claimants (ib. 14). Unless specially authorized to do so, the Attorney could not appoint another Attorney in his place; and the principal could revoke the power of Attorney at his will (ib. 123, 4; 123, 3). In case the principal appointed another Attorney,this was an implied revocation of the power granted to the first one, unless the second appointment was simply intended as a precautionary measure whereby the second Attorney was substituted only in case the first could not act (ib.). If the subject of contention was a debt, the death of the principal revoked the power of Attorney; but if it was real estate, or if the Attorney had been given authority through the ceremony of symbolical seizure (Ḳinyan), the death of the principal was not a revocation of the power (ib. 1). A husband could act as Attorney for his wife without any special power given to him, in controversies concerning those portions of his wife's property in which he had usufructuary rights; but he had no such implied power in matters concerning those portions of her estate the fruits of which she enjoyed (Giṭ. 48b; Ḥoshen Mishpaṭ, l.c. 8). Members of a partnership or heirs of an estate of which no partition had been made could appear as attorneys for their copartners or coheirs without any special power given to them, because, their interest being joint, each is authorized to act for the others. If, however, one of the coheirs or copartners was absent in another city, and unable therefore to intervene personally in the case, if he so chose to do, he was not bound by the action of his coheir or copartner; and it was a rule, therefore, that in cases where a coheir or copartner appeared to represent the estate, the defendant might demand a production of the power of Attorney from absent parties interested (Ket. 94a; Maimonides, "Yad," Sheluḥin, iii. 3; Ḥoshen Mishpaṭ, l.c. 9). The defendant was not entitled to be represented at court by an Attorney (Ḥoshen Mishpaṭ, 124, 1). 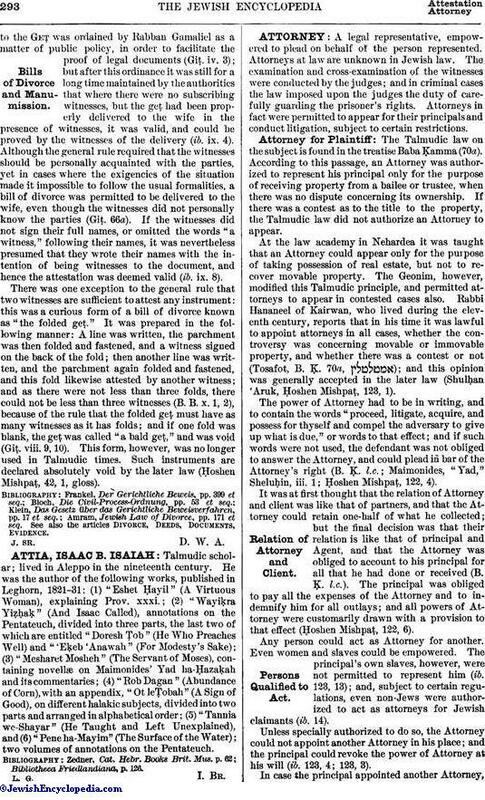 The only case, it appears, known to the Talmudists, in which it was assumed that an Attorney ( , ἐντολεὸς) might eventually be permitted to appear for the defendant, was one in which the high priest was sued (Yer. Sanh. ii., beginning 19d). The principal reason for compelling the defendant to appear in person seems to have been the feeling that if he were obliged to face the plaintiff in open court, there would be a slighter probability of false plea or concealment of the truth on his part (Ḥoshen Mishpaṭ, l.c. ; Beer ha-Golah, ib.). Women of standing and scholars were respected to this extent, that they were permitted to make their statements in their own homes in the presence of the plaintiff; and the record of their statements was taken by the official recorder and presented to the court (Asheri Sheb. iv. 2; Ḥoshen Mishpaṭ, l.c.). See Agency, and Attorney, Power of.